Bruynzeel® Design® Aquarel Watercolor Pencil 48-Set. These watercolor pencils are made from quality materials with Dutch craftsmanship. Light cedar wood casings for best sharpening. Pencils are glued in a two part process to ensure casing strength. The core is made from extremely lightfast, select pigments and a liquid wax binder for pure pigmentation, extreme blendability, and no wax bloom. 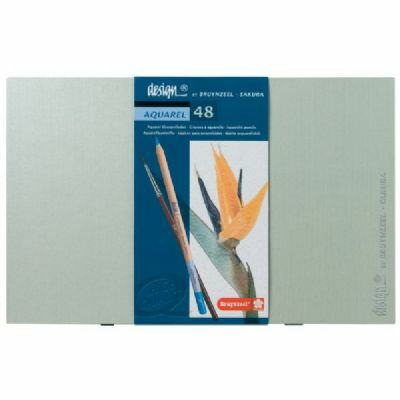 Higher quality binder on aquarel pencils ensures an effortless breakdown of the pigment when introduced to water. 3.8mm core. Set of 48 includes: White, yellow ochre, sanguine, dark green, light flesh, brown pink, emerald, black, vermillion, olive green, light ultramarine, crimson red, deep red, ultramarine, light green, Smyrna blue, dark pink, light blue, green, burnt ochre, mid orange, carmine, permanent orange, magenta, ice green, mid brown grey, Naples yellow, umber, light lemon yellow, cobalt blue, flesh, dull cold grey, deep yellow, sienna, mauve, candy pink, dark violet, orange, dark brown, blue violet, cold grey, mid brown, Prussian blue, light grey, lemon yellow, Havana brown, red violet, dark grey.